​Jack Casey, local author and attorney spoke about Kateri Tekakwitha who was a 17th century Indian woman from the village of Ossemenom now Auriesville. He provided an insightful story about her life and friendship with Jesuit missionaries. ​Saint John Honeywood lived in the area in the late 1700s. Steve will share with us this fabulous, eccentric busy body and gossip who was a poet, painter, teacher, and newspaper publisher. Honeywood's views on gender roles were 200 years ahead of this time. 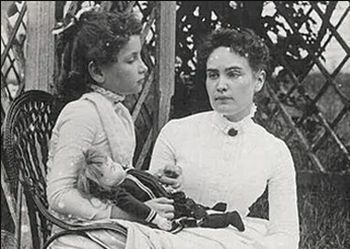 March 19, 2017 "Anne Sullivan" by Phyllis Chapman: Phyllis Chapman in costume portrayed Anne Sullivan, the teacher of Helen Keller. 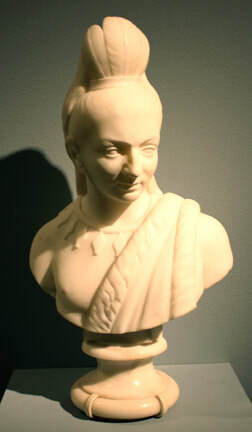 June 2017 "Edmonia Lewis" by Bobbie Reno, East Greenbush Town Historian (rescheduled from February) Edmonia was born to an African American father and a Chippewa mother. She spent time as a young girl in Greenbush. She overcame numerous obstacles and became an internationally-known sculptor. ​Fall outing to the Bronck House in Coxsackie. The Bronck House is the Hudson Valley's oldest home. Part of it was constructed in 1663. It is owned and operated by the Greene County Historical Society. January 8, 2017 "Steamboats on the Hudson" by Tom Allison For a century beginning with the Clermont in 1807, steamboats were the best way to get between Albany and New York City. Tom shared a collection of images from around Albany which showed what life about steamboats was like. Ray, a longtime area farmer presented a lecture on the origins of apples and their place in history. May 21, 2017 "Wild Women of Rensselaer County" by Kathy Sheehan, Rensselaer County and Troy City historian. Kathy presented a lecture on women of Rensselaer County who had an impact on our county, state and nation and whose legacy is still evident today.